Last week (30th September) I organised the first in what I hope will be a series of live-streams in my current role as Digital Manager at Directors UK. 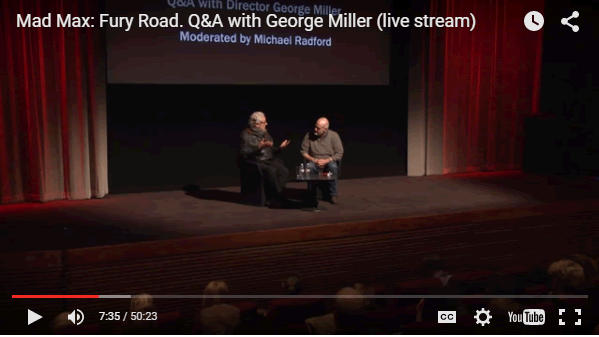 The event was a Q&A with George Miller following a screening of his latest film Mad Max: Fury Road (big, loud, stupid, fun) at BAFTA. Now that Youtube’s live-streaming platform is (seemingly) properly established it is really, really straightforward (and free) to stream events like this. It was essentially a 1-camera, 2-speaker event (with a few audience questions at the end) which means that the technical demands were…minimal and as such feels like it could fairly easily be explained for anyone who is interested in this sort of thing. I’m still of the opinion that live-streaming isn’t always necessarily the right choice when covering an event but for last night it seemed appropriate; it was a sold-out, members-only event for which there was huge demand, it was not going to be repeated and it allowed members who were unable to make the screening (the membership is spread across the country and globe) to enjoy the Q&A with a hugely experienced and respected director. Both speakers were mic-ed up with wireless lapel mics that were going into the BAFTA front-of-house PA. There were also a couple of hand-held wireless mics that we used for audience questions, these were also going into the PA.
We then took an audio feed from the desk and ran that into the camera. The combined audio/video feed was then run via the SDI (BNC) output of the camera into our Black Magic Ultrastudio 4k which was hooked into the company’s Macbook via thunderbolt. Oh and we were using a dedicated, wired, highspeed internet connection at BAFTA. This isn’t always the way I’d set things up but as it was the first time we’d done anything like this I wanted to have the backup of everything being recorded on the camera in case the laptop blew up or whatever. In the future we’ll probably experiment with making the setup more sophisticated. We were just running the raw feed from the 1 camera, no titles or anything this time around but this has shown that achieving a relatively watchable feed from an event like this isn’t overly expensive or difficult (in fact we were probably hugely over-specced for this particular job). We owned all of the equipment apart from the camera and the mics (camera was hired, mics were a combination of hire and BAFTA’s). The Ultrastudio is probably the biggest piece of overkill for this particular job, Black Magic (and many other manufacturers) do lots of cheaper, simpler pieces of kit that’ll enable you to do the same thing. Anyway, hope this was of some use, I wrote it mainly because there was a total dearth of first-person accounts from people who have done this sort of thing. If you’ve got any questions…ask! I think this sort of setup (or something slightly simpler) could be entirely appropriate for lots (most?) Q&A/discussion-y type events and, as I have said above, is cheap (ish) and easy to do. Further, final thoughts: I wrote a bit of a doubting piece about live-streaming last Spring (you can read it here), however I think what I didn’t do particularly well in that piece was differentiate between live-streaming performance and live-streaming far “simpler” events (such as the one I’ve described above). Also (fortunately for the coherence of my argument) I think that this particular event does tick a lot of the boxes I’d raised when questioning the need for live-streaming (around “must-see”-ness) – we were also tweeting from the event, and some of the issues around cost and expertise that I raised in 2014 are now either no longer relevant or easy for others to look after in the line of what they were doing anyway for this event (lighting, sound etc). There are definitely things we can look at exploring around how we bring the online audience more “into the room” so it isn’t just a broadcast (how might we incorporate any discussions that may develop on social media etc as a result of the live-stream).